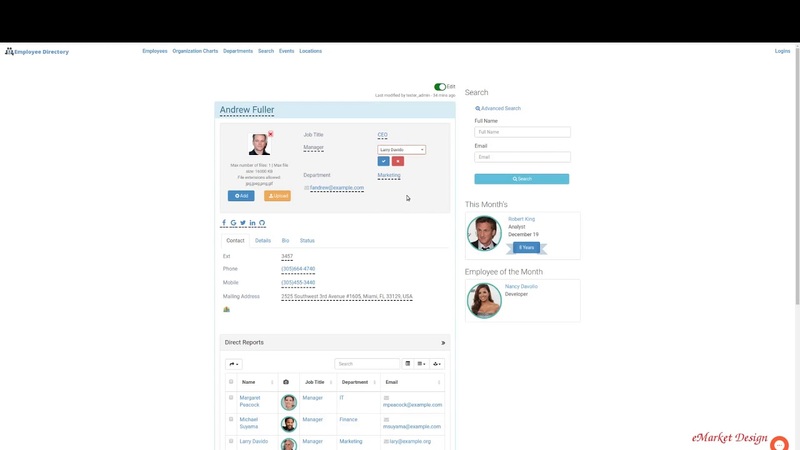 Employee Directory allows employees update their own information from the frontend of your site. If you'd like to keep employees out of WordPress dashboard but need them to update the fields you specify, Employee Directory comes with powerful frontend editing capability. Non-technical users who are not familiar with WordPress dashboard can edit their own information with a few clicks. This feature significantly improves user adoption of Employee Directory. Administrators can pick and choose which fields will be editable by employees. This feature allows updates of certain employee fields from external systems such as Microsoft Active Directory/LDAP servers without compromising data integrity. Administrators can completely block access to WordPress dashboard, enhancing the safety and security of your site and directory information. WordPress frontend does not have the same heavy processing required by the dashboard. This translates to faster page loads in the frontend. Users can update their own information using any device with slower Internet connection speeds.